Seeds for the peyote cactus (lophophora williamsii), growing instructions are included. The peyote cactus grows very slowly. It takes about a year for the seeds to produce roots and start growing. 2 � Soak the compost using boiling water to kill parasites. Once soaked, allow to drain and cool for about an hour. 3 � Sprinkle seeds evenly over the compost mix, and then gently press seeds down and level with top of mix using a spoon. 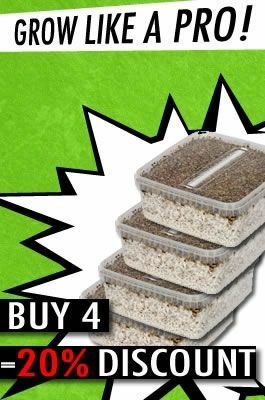 4 � Cover with seed tray cover, or enclose pots in zip lock plastic bags. 5 � Place under grow lights or in a well lit window but not in direct sunlight as this could scorch your seedlings. Temperature should be between 60 to 100 degrees F (15 degrees C to 37.5 degrees C). 6 � If pots are placed in zip lock bags water might not be needed for months. If seed trays begin to dry out, spray to moisten the surface. 7 � Seeds should germinate within 2 to 14 days. 8 � When seedlings are about six weeks old begin sliding tops of trays a little each day to acclimatize seedlings to surrounding environment. If using pots in zip lock bags, begin poking small holes each day for a couple of weeks to acclimatize seedlings. 9 - Keep seedlings in indirect sunlight for about six months, and then slowly let them have more light. Seedlings should have a lush green color if the light levels are right. If the epidermis turns red it means they are getting too much light. If so raise lights or shade window with appropriate material possibly cheese cloth. 10 � Be in no hurry to repot your seedlings. Lophophora enjoys the company of others, so wait until they are really fighting for room. Seedlings will germinate in three to ten days, but can and have germinated in as little as twenty four hours. Initially they�ll appear as little green balls, but a trained eye will soon notice the cotyledons and first set of areoles. Lights � I keep my lights on using timers. Nothing elaborate is needed. Lights should be turned on for twelve to sixteen hours a day. Temperature � Most plants seem to like fluctuating temperature, and Lophophora does as well. If the temperature is either to hot or too cold seeds will not germinate. Lophophora seems to bear temperatures between 5 and 41 degrees C. For germination purposes I have found that a day time temperature of anything from 25 to 41 degrees C works very well, so long as the night time temperature does decrease. Night time temperatures should drop lower than 25 degrees C, and as low as 10 degrees C. There seems to be a cross over between day and night time temperature that actually cause the seeds to sprout, and unless this cross over is met most of your seeds will not germinate. The maximum temperatures vary from 29.1 degrees centigrade to 40.2 degrees, and minimum temperatures range from 1.9 to 10.2 degrees centigrade. Also, in the wild Lophophora exhibits a wide range of aridity, between 64.0 and 394.0. Adult Peyote plants can tolerate temperatures within a range of 45-100 degrees Fahrenheit. If soil is kept dry, it can survive temperatures as low as 30o F. Frequent watering and a shade cloth will protect it from temperatures exceeding 120 degrees F. Peyote is very sensitive to frost or prolonged near freezing temperatures and is easily injured or killed by frost. It should be brought inside in locations where the temperatures drop below 40 degrees F.
Water - In the growing season, I water my plants twice a week on a regular basis. Some might think this excessive but my plants are robust and very healthy. I also add a very light fertilizer with every watering. These baby cacti are the cutest! I wasn't too hopeful about "hard to sprout" seeds, but I followed the directions on the website and I got 4 out of 10 to sprout! I bought this product along with peyote buttons and also san pedro seeds and only a couple germinated and took a very long time to become visible although the container they came with worked very well and was easy to keep the proper moisture. I would not suggest these to beginner growers or people who have a hard time keeping houseplants alive but I do think it is a beautiful species with very pretty flowers and should be appreciated for not only its beauty but also its power. I also believe that this plant should be respected and consumed with caution I myself do not partake in the ritual of eating them I would regret it too much after having them so long but anyone who does eat hem should have a friend with them that can take care and watch over them should thing not go so well.